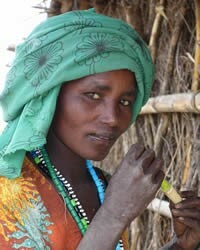 Overview: The Afar and the Saho are two closely related ethnic groups living in Ethiopia and Eritrea. Their languages are classified as Eastern Cushitic. Along the coast some make their living as fishermen, but a majority are pastoral nomads who work herds of sheep, cattle, goats, and camels in the lowland deserts. Both groups follow the Sunni branch of Islam.